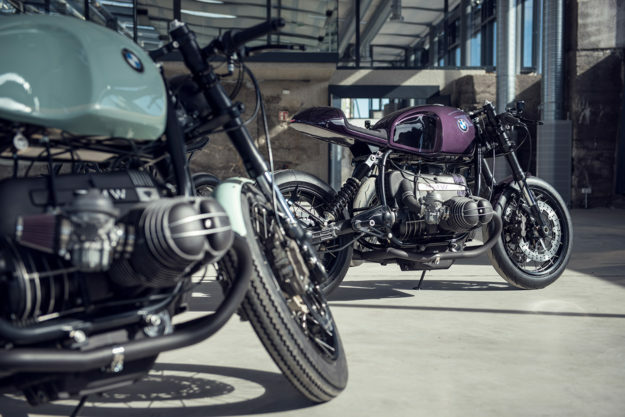 Building custom motorcycles for a living sounds like a dream. Who wouldn’t want to spend all day in the workshop—getting their hands dirty and letting their creativity run wild? The reality is, it takes more than talent and a shed full of tools to create a sustainable business; you need a good head for business too. And despite their tender years, Tom Konecny and Pablo Steigleder of Munich’s Diamond Atelier are two of the most switched on dudes we’ve met. We haven’t heard from Diamond in a while—but that’s only because the boys have been heads down on their latest project. 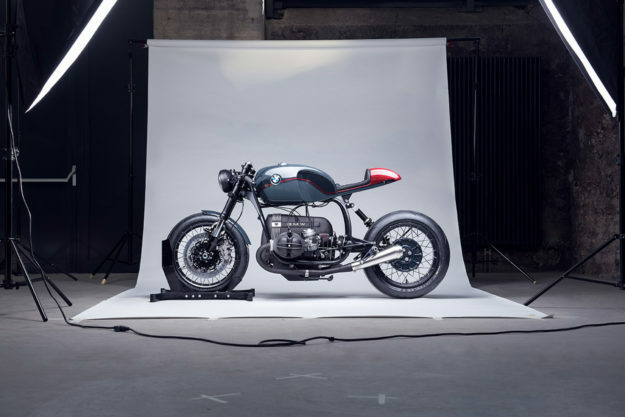 And here it is: a limited production run of stunning BMW café racers called the Mark II Series. 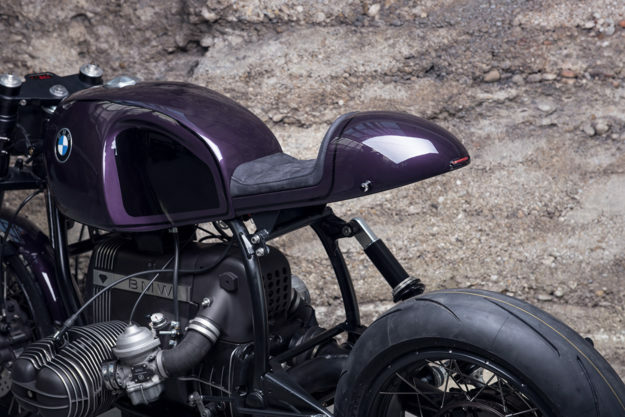 Diamond’s bikes are always radical and aggressive (we once referred to them as “more of a swift kick to the jaw than a breath of fresh air”), but a completely bespoke machine takes time to complete. The Mark II Series is a bid at capturing that same ethos, with an end product that’s a bit more accessible. 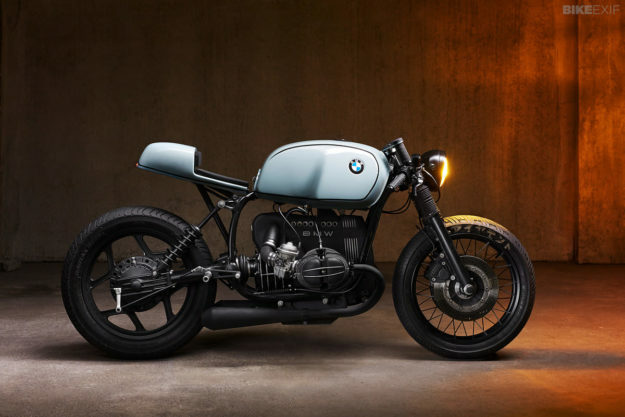 Naturally, each Mark II starts out as a classic R-series BMW. Diamond have turned screws on a number of Beemers already, so it makes sense to go with what they know. The engines vary according to each client’s specifications, but the frames are always from Monolever models, with their single-sided swingarm. Each bike is given new bodywork and a host of other changes. 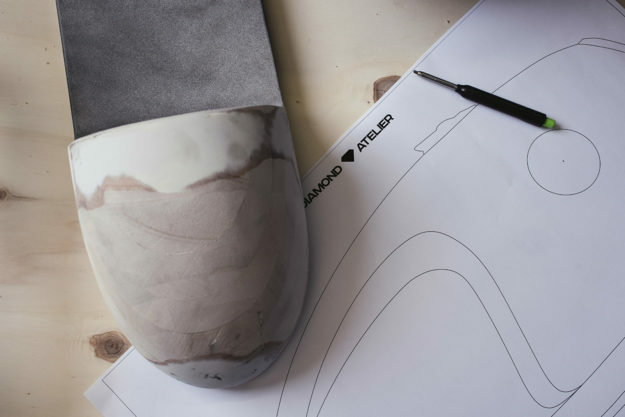 This is where it gets interesting; rather than build everything from scratch for each build, Diamond went through the process of designing and prototyping each part for production. That includes bits like the redesigned fuel tank, tailpiece, and engine covers (and a whole lot more). 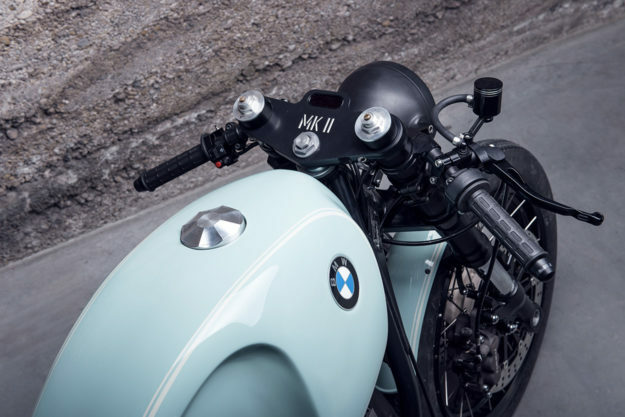 The tail section’s a real highlight—it’s designed to ‘float,’ with a hidden, CAD-designed subframe fully supporting the weight of the rider. All parts have design patents and won’t be sold individually. The subframe is even compliant with Germany’s uber-strict TÜV standard. Diamond tell us that they aren’t pitching the Mark II as a ‘race-spec’ bike—but they have still added a few key performance upgrades. There are refurbished 53mm upside-down forks up front, and a fully adjustable Wilbers shock out back. 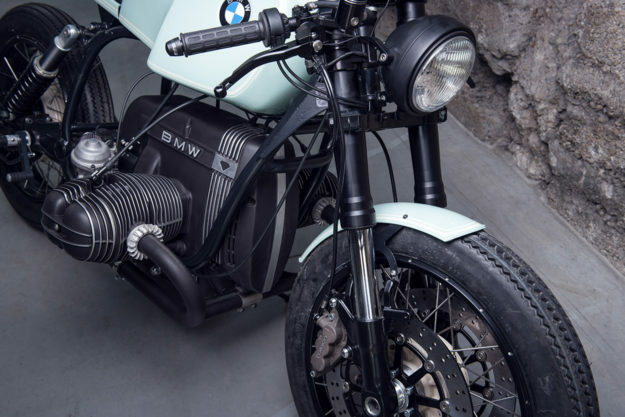 The wheels are pieced together from three different bikes in the BMW fold, and feature BMW’s neat, tubeless ‘cross spoke’ design. Braking upgrades include 320mm discs with 6-piston Tokico calipers, hooked up to an ABM radial master cylinder via braided lines. When necessary, the donor engines are completely rebuilt, and the transmissions and final drives overhauled. The carbs are refurbished too, and jetted to match whatever intake and exhaust system the customer opts for. Each Mark II is rewired as well, using Kellermann and Motogadget components, along with a few bits that have been made just for the series. Diamond have gone to great lengths to tuck everything away too. Of course, each Mark II can be ordered with personalized options. 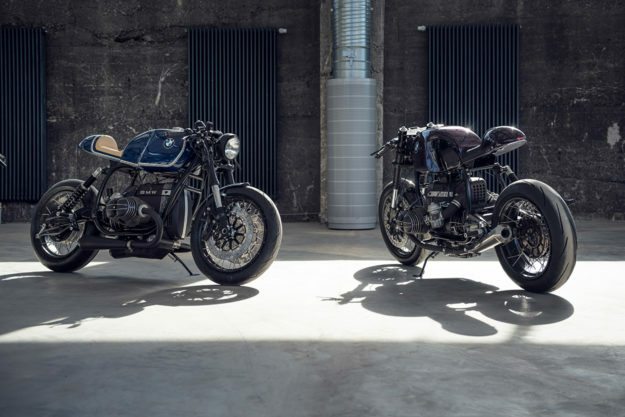 The bikes you see here are sporting two different exhaust systems, three different air intake setups, and both analog and digital speedos. You also get a choice of 17” or 18” wheels, and a solo or two-up seat. And the clip-ons and rear-sets are fully adjustable, helping each rider fine-tune their ergonomics. Most importantly, you can pick any color or livery you want. So you could end up with anything from a laid-back café hopper (like the turquoise bike above, complete with 18” Firestone Deluxe Champions), to a sharp canyon carver (like the purple bike below, with its sticky 17” Metzeler Racetecs). We’d be happy with any of these machines—they’re as sharp as anything we’ve seen from Diamond. But we’re even more impressed at how Tom and Pablo have have stepped things up. So here’s a look at how they got to this point—and some of the challenges they faced along the way. What sparked the idea to launch a ‘series’ of bikes? We were facing an immense issue. It was not a lack of clients—in fact it was the exact opposite. The demand for our products outnumbered our possible output many times, which forced us to create long waiting lists for future projects and eventually declining many commissions we would have loved to accept. We were even forced to cancel events and meetings we were going to attend, to make sure we could cope with the work. As a result, some people perceived us as acting exclusive, arrogant and cocky. This was the exact opposite of what we wanted. We understood that the time has come to decide which direction to go in. So we decided to take the risk and expand the company to see how far we can go. Does that mean you’re done with ‘one-off’ builds? We will always produce our unique “DA#” builds. These projects shape our brand, they are what we live for. They are radical, aggressive and set the bar higher one notch at a time. Sometimes I come up with concept in my mind and eventually turn it into reality at 3am if necessary. We can never foresee what the exact outcome on our DA# builds will be, since the best ideas happen spontaneously. At the same time we felt the urge to significantly increase our efficiency, professionalism and simply create more. So we began shaping the idea to launch a small series of custom motorcycles. A small ‘series’ bike is faster paced in production, suitable for a larger group of people, and carries less risk regarding the outcome. 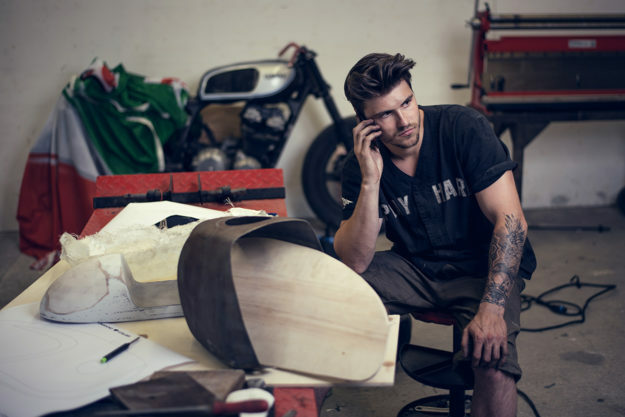 With our first series we’re trying to make our products more approachable, so more people can enjoy the feeling of owning and riding a custom motorcycle. How different was your approach this time around? Usually when starting a new custom project, the design is the first thing that needs to be worked out. 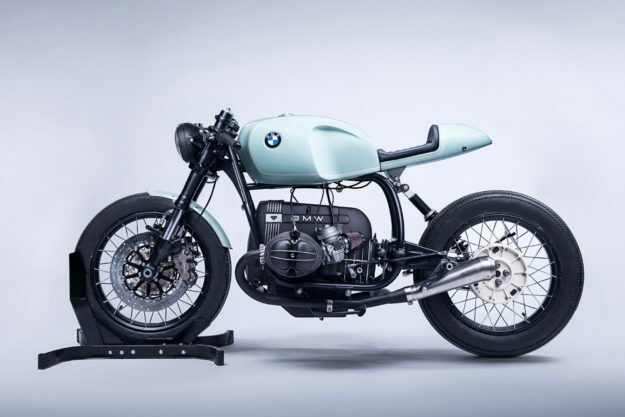 But this requires a predefined standard, such as a stock donor bike, to base a design on. 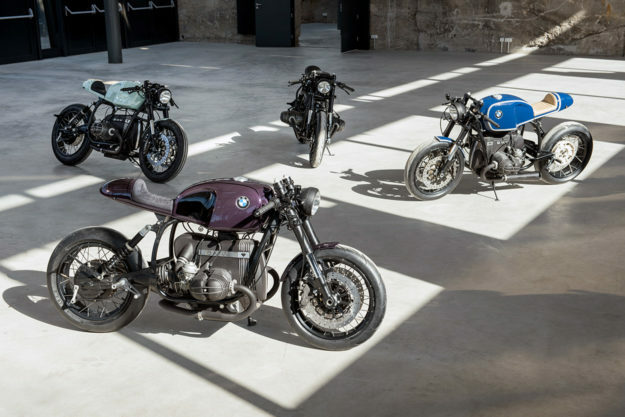 In our case there was no such standard—we started from scratch on the most fundamental pieces such as the gas tank, frame, forks and wheel set. This doesn’t sound overly spectacular when considering a one-off custom build, but given that our parts needed to be scalable and reproducible to the exact same key figures, this quickly became the hardest part of the process to tackle. The idea came up to produce parts industrially. Even though the fixed costs would be immense, the quality standard (contrary to popular belief!) 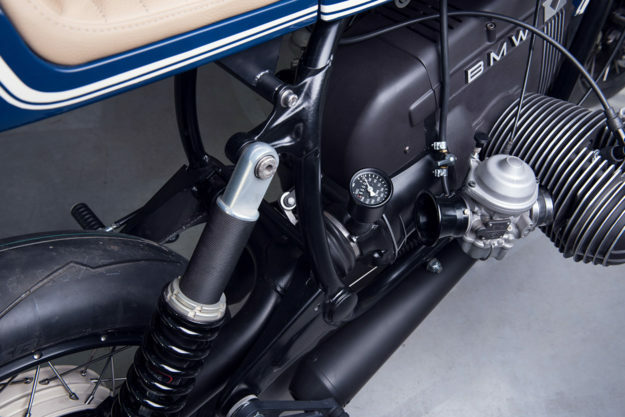 would rise to an unmatched level in bespoke motorcycle building. And variable costs would decrease, directly reflecting on the costs of the finished product. Eventually we teamed up with Mr. Jens Buchert, an engineering expert from Munich who agreed to ‘translate’ our ideas into viable versions for industrial partners in Germany. 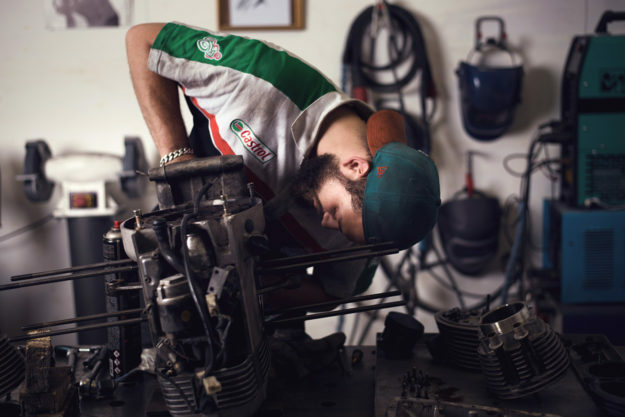 Through this partnership we are able to produce what we believe is the highest quality bespoke motorcycle on a reproducible level on the current market. And we won’t just sit back and relax now—there’s a constant development ongoing during manufacturing. What about the design, how did that come about? We knew that we needed to come up with a bike that would appear radical enough to unmistakably count as a true Diamond Atelier build. It also needed to be well balanced and perfectly proportioned, to work as a blank canvas for the personalization options we offer within the Mark II Series. 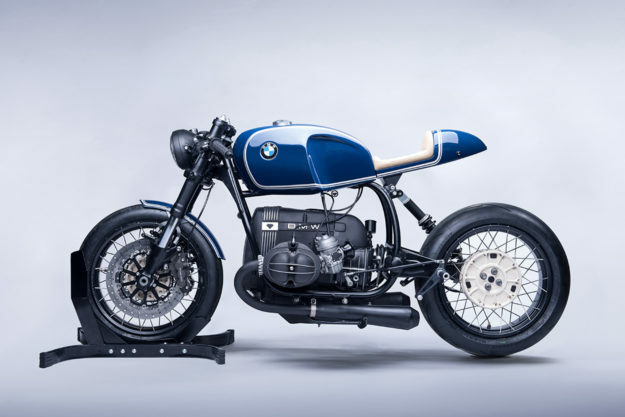 Having motorcycle designer Julian Weber on board during the process, who selflessly spent countless nights creating life-like renderings of THE perfect cafe racer, we finally came up with our best design up to this day. It features a timeless shape, as well as an aggressive stance and low-slung silhouette in the true Diamond Atelier manner. One could say that the Mark II Series, style-wise, is a homage to our first ever build, the DA#1 (below). A lot of people don’t realize what an in-depth process design can be… It’s important to have all components of the bike work together in the big picture. The length of the forks combined with the size of the wheel set makes for the perfect stance. The kick- up tail section flows with the angle of the gas tank. The single-sided exhaust ranges back as far as the bodywork—which is exactly to the center of the rear hub. There are tons of details to be found, many only on a second, third or tenth look. How important is personalization with the Mark II Series? Building a small series of motorcycles doesn’t mean they all need to look alike, such as production vehicles from OEMs. You can go batshit crazy on the personalization options—and we hope people do. There are tons of things we can do with this blank canvas. The bikes shown here are just a humble start. How many Mark IIs are you planning to produce? The first run—which had special pricing since people did not know what they were getting into, and ordered a bike solely on a Photoshop rendering—is ten prototypes. From then the Mark II becomes a constant series. But the availability is not infinite. We’ll do as many as we want and eventually stop production to go for different projects or start a new series. So what is the starting price, for a basic Mark II? 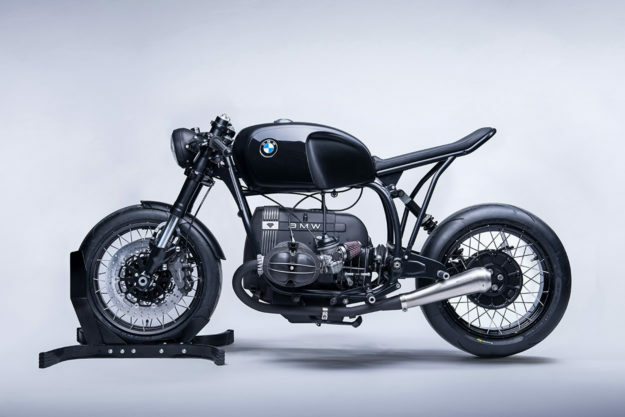 They start at €20.990 (around $22,400), including the donor motorcycle. Any closing thoughts? With the Mark II Series I believe we have created a cross between high quality bespoke motorcycles and reasonable delivery times and pricing. Thus we hope to be able to reach more people with our brand and in general spread more Diamond Atelier bikes around the globe. Even if this project is just an experiment as we strive to improve our skills, it is a win-win situation for all sides. 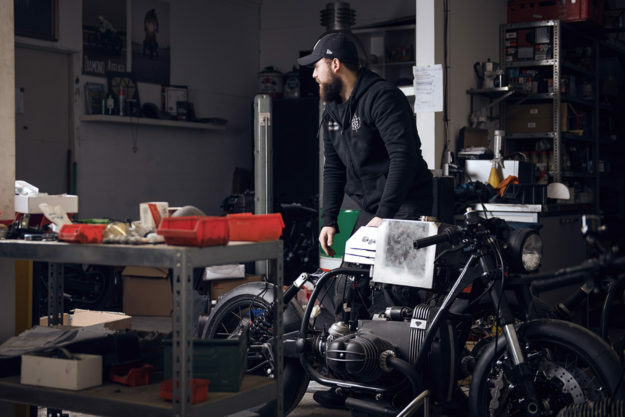 We gain tons of experience and knowledge from the work with our new partners and a completely different production approach and in return more people get to have their own custom motorcycle, which enriches their life even by just a tiny bit. As always, in the custom world you get what you pay for—but this sort of limited production model should make high-end custom work more accessible to more people. After all, $22,000 is roughly the cost of a mass produced Harley Road Glide. Here’s wishing Tom and Pablo the best of luck with their new approach.